The below rules apply to all Mount Pleasant tennis ladders. These ladders will form the basis of selection for league teams; however committee discretion may be applied in the selection of such teams. This is to include performance in recent club and open tournaments, participation in pre-league practice, coaching sessions and round robins and past league standards where applicable. Such committee discretion will be co-ordinated by the respective Club Captains. The first set of rules relate to the singles ladders which are managed on www.clubmanager.ie. The second set relate to the doubles ladder which are managed through the challenge books in the lobby of the club. New players should request a logon to www.clubmanager.ie from the relevant steward. Once logged in, they can choose the ladder and elect to join it. Players who remove themselves from the ladder must wait for a minimum period of one month from removal before being able to return to the ladder. In such cases returning players must contact the relevant steward who, at their discretion, may allow a challenge anywhere on the ladder. In both cases, if the challenger wins they will assume the ladder position of their opponent and all other players behind this position will move down 1 place. If the challenger loses they go directly to the bottom of the ladder. Players who are on a holiday rest period from the ladder will be ignored when your targets are calculated by the software. Example:- if a player can challenge up to 4 places and one of those places is sitting out, they can challenge up to 5 places. Possible challenges will be marked as targets with a yellow tennis ball icon. To make a challenge, click on a player and you will be asked to confirm the challenge. The player will receive and email informing them of the challenge. It is the responsibility of the challenger to follow up with the player challenged by text within the same day. Both the player(s) making the challenge and receiving the challenge must have at least two days of availability within the given time period after the challenge has been registered. Challenges cannot be made to an opponent solely on verbal agreement as they must be logged on www.clubmanager.ie Should such an arrangement occur a subsequent challenger logging a challenge will be given priority over the verbal agreement. Singles challenges must be played within 14 days of the challenge date. If a challenge and not played within the allocated time because of the refusal of the person being challenged to play/respond to contact, the challenger will be awarded a walkover unless exceptional circumstances apply as outlined under ‘Section 8 - Exemptions’. 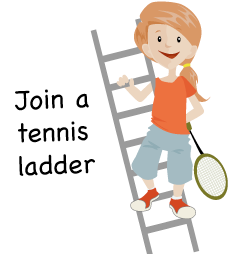 If a walkover is given then the person being challenged drops to one place below the challenger on the ladder. The challenger and any players between them will be automatically moved up 1 place. However if the challenger is using a “free challenge” then the person being challenged will drop by the maximum reach in the players range (see section 2) and the challenger will retain their “free challenge”. Please contact a steward to enter this result. If a date and time cannot be agreed for the challenge within the 14 day period, the challenger should contact the steward who may authorise an extension in exceptional circumstances. Entering false results will result in removal from the Challenge Ladder for a period of six months from the date of the challenge. The player making the challenge is responsible for providing acceptable tennis balls and light cards (if applicable). In adverse weather conditions, a decision not to play must be mutually agreed by both players If a rescheduled date agreed is outside of the original 14 days, it must be referred to the respective steward. If, after agreeing to the match, the challenger becomes unable to play on the date/time agreed, the challenge is cancelled. However, if the player being challenged is unable to play on the date/time agreed, he/she must offer new availability to the challenger within the given time period. Failure to do so will result in a walkover being granted to the challenger. All matches are best of 3 sets with tie breaks in all sets and full games. Players who lose a challenge match must wait 48 hours from that date before issuing a challenge to any other player. They must also wait 14 days from that date before re-challenging the player who beat them. Winners of a match may issue a new challenge straight away but do not have to accept a challenge for 24 hours. Players are granted 4 weeks holidays per year which they can use to sit out the ladder for a period of time. Players who require exemptions for longer periods due to illness/injury/pregnancy/bereavement/holidays should contact the ladder steward. They will be temporarily removed from the ladder & reinserted at approximately the same position once they are available again. They cannot issue or accept a challenge during this time. Any player winning a challenge match may refuse a challenge for a period of 24 hours after their match. In that time they may place a challenge of their own but this must be recorded in the Challenge Book within this 24 hour period. Failure to do so will allow any subsequent challenges to take precedence. When a player is returning to the ladder after a period of injury, they must make a request to be ladder steward to be reactivated. They cannot issue a challenge for a period of 7 days after doing so. During this 7 day period such a player may still be challenged. Any player returning from injury who wishes to play league must be available for at least one ladder match before league team selection. Players unable to do so may not be considered for league. Doubles challenges are entered into the challenge folder kept in the tennis lobby. They are not managed by clubmanager. New players to the ladder may challenge any available player on the ladder. Players who remove themselves from the ladder must wait for a minimum period of one month from removal before being able to return to the ladder. In such cases returning players must contact the relevant Captain who, at their discretion, may allow a challenge anywhere on the ladder. The positions of those on the Exemption List (see below 'Exemptions') can be ignored when calculating whom you can challenge. Example: If a player can challenge up 4 places and one of those places is exempt, they can then challenge up 5 places. The Challenge Book (including Exemptions List) is kept in the waiting area / club entrance. Choose an opponent within that range. Ensure the chosen player is not currently involved in any other challenge. Ensure the chosen player is not on the Exemption List. Ensure that any recent ladder results, which have not yet been transferred to the ladder, do not push the opponent outside of the challenge range. It is the responsibility of the challenger to ensure the challenge is written in the Challenge Book immediately and that their opponent is informed on the same day. Both the player(s) making the challenge and receiving the challenge must have at least one date of availability within the given time period after the challenge has been registered. Challenges cannot be made to an opponent solely on verbal agreement as they must be logged in the Challenge Book. Should such an arrangement occur a subsequent challenger logging a challenge will be given priority over the verbal agreement. Doubles challenges must be played within 14 days of the challenge date. All players must accept challenges unless they are already involved in a challenge, are on the Exemption List or exceptional circumstances apply. If a challenge is accepted and not played within the allocated time because of the refusal of the person being challenged to play, please contact the steward who may award the challenger a walkover unless exceptional circumstances apply, e.g. as outlined under ‘Section 8 - Exemptions’. If a date and time cannot be agreed for the challenge within the 10/14 day period, the challenger should contact their Club Captain who may authorise an extension in exceptional circumstances. Only challenges made through this process will be recognised. Players are not allowed to commit themselves to future challenges while involved in an existing challenge. In adverse weather conditions, a decision not to play must be mutually agreed by both players. If a postponement is agreed by both players, it must be written in the challenge book. If rescheduled date agreed is outside of the original 10/14 days, it must be referred to the respective captain. If, after agreeing to the match, the challenger becomes unable to play on the date/time agreed the challenge is cancelled. Where a match is started but not completed the circumstances should be reported to the respective Captain. Players are exempt from ladder challenges if they are ill, injured, pregnant, bereaved or on holidays. Players unavailable for any other exceptional circumstances should contact the Club Captain. If a player is exempt for a period less than 2 weeks they must enter their details on the Exemption list in the Challenge Book. If unavailable for a period greater than 2 weeks players must inform the club captain. Players on the Exemption List cannot issue or accept a challenge. When a player is returning to the ladder after a period of injury, they must inform the relevant Captain and come off the Exemption List but cannot issue a challenge for a period of 7 days after doing so. During this 7 day period such a player may still be challenged. All results in the annual Club Championships tournament (not including Handicap events) will constitute ladder challenges regardless of Challenge Range.